Clarke rushed for a school-record 921 yards in 1938 at West Virginia and was chosen by the Bears in the 13th round of the 1940 NFL draft. He rushed for 258 yards, intercepted four passes, one of which he returned for a touchdown, and capped his rookie year with two TDs scored in the 73-0 NFL Championship win over Washington. He began returning kicks in ’41 and in 1942 he rushed for 273 yards, gained 131 yards on six pass receptions, added another 138 yards on kick returns, and scored six TDs. Bears went 8-1-1 to finish first in the NFL Western Division while leading the league in total yards (3961), passing yards (2310), touchdowns (45), and scoring (315 points). Won NFL Championship over Washington Redskins (41-21). 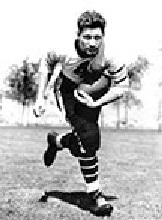 Clarke left the Bears for service in the US Navy after the 1943 season, but following action in the South Pacific was a player/coach for the San Diego Bombers of the minor Pacific Coast Football League in 1945 and ranked second in the circuit with six touchdowns. He joined the Los Angeles Dons of the new AAFC in ’46 and rushed for 250 yards and caught 10 passes. Clarke’s production dropped off in 1947 and ’48, his last season during which he was dealt to the Chicago Rockets. Overall with the Bears, Clarke rushed for 1209 yards on 262 carries (4.6 avg.) and 8 touchdowns, caught 34 passes for 807 yards (23.7 avg.) and 9 TDs, intercepted 11 passes, returned 19 punts for a 15.3 average, and 23 kickoffs for a 28.0 average. He scored a total of 20 TDs. In the AAFC, he ran for 502 yards, had 17 catches for 215 yards, intercepted two passes, and accumulated a total of 458 yards on kick returns, scoring four touchdowns.